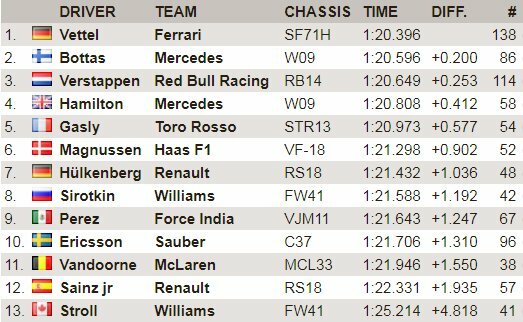 It's not an impressive time, Hamilton was 1 second faster on the same tire last week in worse conditions. Medium tyre is right choice in those conditions. Pretty cold. is he praising Mercedes again? Lap Time Boys and Girls! According to Motorsport IT, SF71-H (3678) is only 2mm shoter than W09 (3680). Max' 20-lap stint on the mediums: 22.6 - 34.7 - 21.6 - 21.9 - 23.4 - 21.1 - 29.8 - 21.1 - 30.6 - 20.9 - 21.7 - 21.5 - 21.7 - 21.3 - 21.7 - 20.7 - 21.0 - 21.4 - 21.3 - 20.9; credits to f1today. No...!! He’s saying why can’t Ferrari be faster. 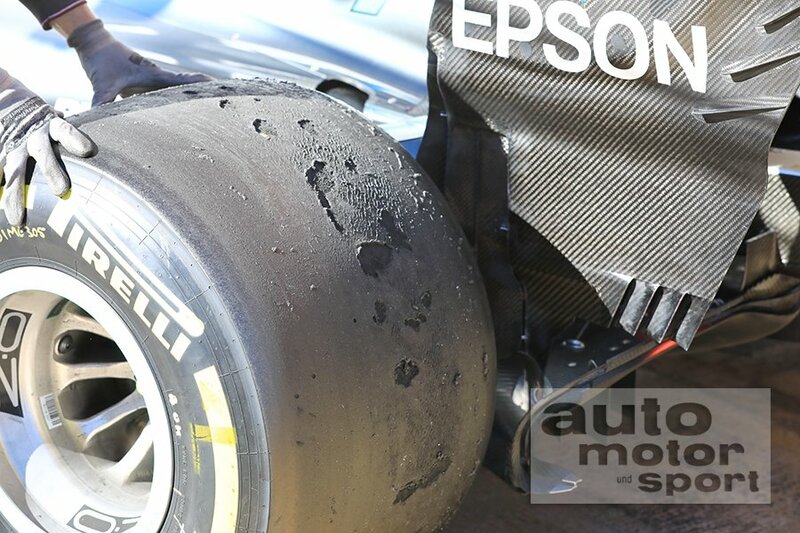 Wow... look at those soft tyres after Valtteri Bottas' last longrun! Track temperature at 31°C right now. Maybe Mercs have problems with softs again. Explains why they only used mediums last week. Any idea how many laps he did on these? Seems Ferrari on top of lap count. I believe Hamilton's run was set on a shorter stint. Anyone know how many laps Hamilton did in that stint? Seb did it at the end of a long run. Thank you. Seb's was nearly double that count and mostly competitive laps aprt from a couple of 1.23s. Other factor track temp. That’s a big varaiable for tyre choice. Under cold track, medium & S is tyre choice. Medium tends to work fast n can have long stint on that. Softs will take time to work. Mclaren broke down NOW it's the RedBull!!!!!!!!!!!!! McLaren says latest Vandoorne stoppage was down to loss of hydraulic pressure. RB has until May to make a decision for the switch according to Renault. Really brings a smile to my face. I'm guessing they'll find a way to address that.